This month as an Asobi Ambassador baby girl and I got to do some building and playing with the Quercetti Daisy Castello. It is a lot of fun and easy storage. I have a review and giveaway of this product for you to be in with a chance to win one of your own. Why not have a look at what we’ve been testing over the last few months. Last month we had some sticktastic fun with Sticky Mosaics. The following month some retro fun with a Vilac Spinning Top. The next month we built and painted our own CALAFANT Robot kit, which has brought us lots of enjoyment and family fun. July we got to review the Quercetti Marble Vortex Run, previously Safari Ltd Toys, then the fun and high flying Curiosity Kits Rocket Launcher, the previous month the fantastic PL-UG Ultimate Den Building Kit and the month before the Seedling Colour The Globe. Kind Toys certainly have a vast range of toys and ones we will be enjoying for many years to come. The Daisy Castello is designed to be robust, with a soft moulded lid to build on and a base for storing all the chunky shapes in. No mess and no bits lying about. Every part is highly coloured and tactile. 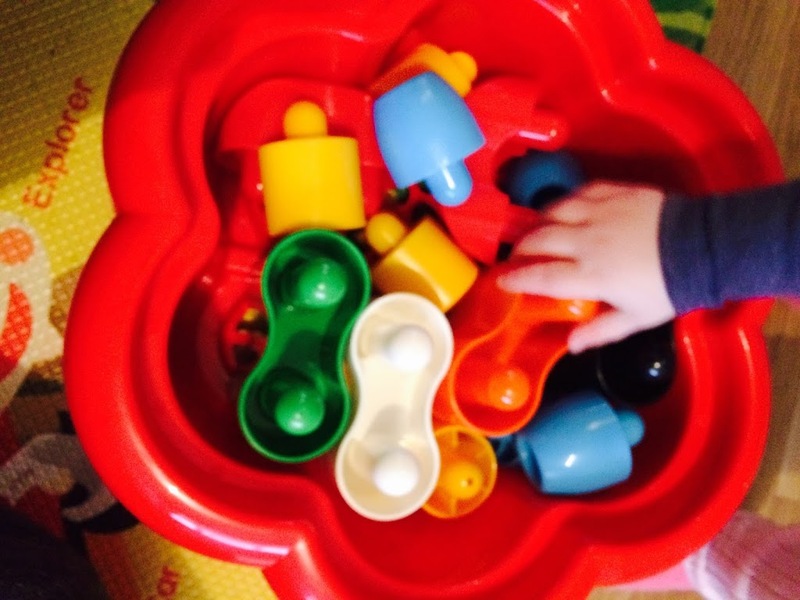 It is perfect for little hands and can be used from ages 1 upwards. I love that this tub created imaginative play and develop fine motor skills in younger ones. However, older ones will have lots of fun building castles, houses, forts, etc. I am not sure how best to describe the bricks/shapes, they are like big pegs that go into the lid of the daisy and you can build like chunky bricks. I think the pictures explain it better on this occasion. Aria loves building towers and knocking them down on this. It is a little big harder to knock them down as they go into each other, like pegs. The pegs are different shapes and are nice and chunky. They fit into each other and are sturdy. 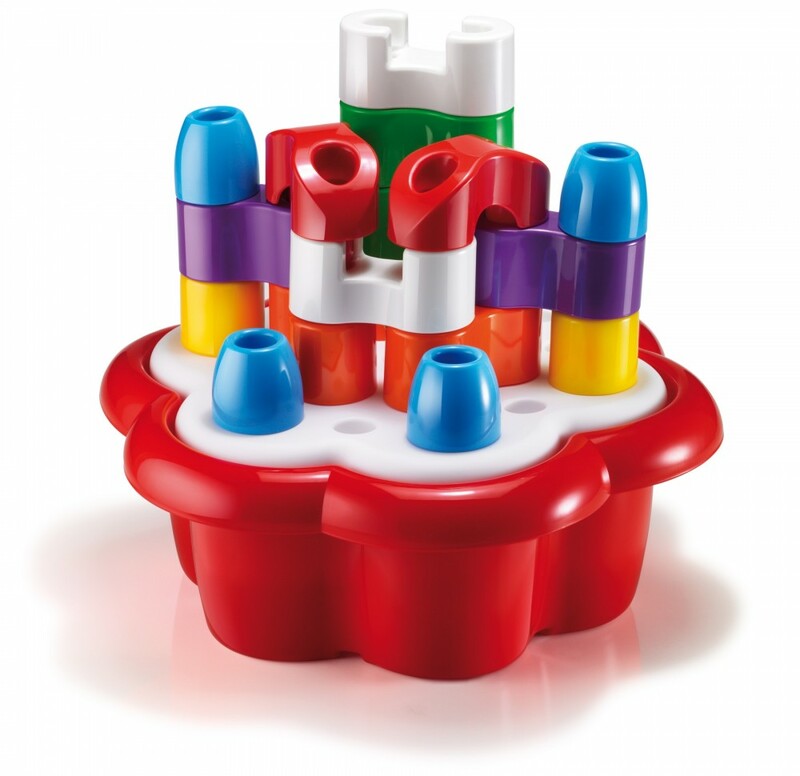 The set contains 8 jumbo pegs, 6 wall pieces, 2 scalloped edged pieces, 2 roof pieces, 1 flower board and a flower bucket. Lots to keep any little one entertained. Aria loves this and has lots of fun. The base bucket is also strong enough to be used a seat, well for Aria anyway. 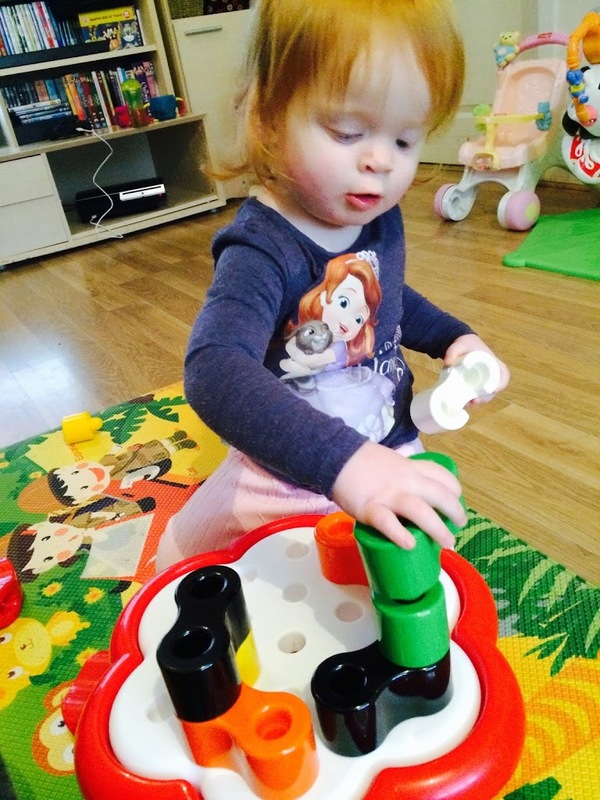 I wasn’t sure about this toy to begin with, but it’s fantastic, especially for little ones. 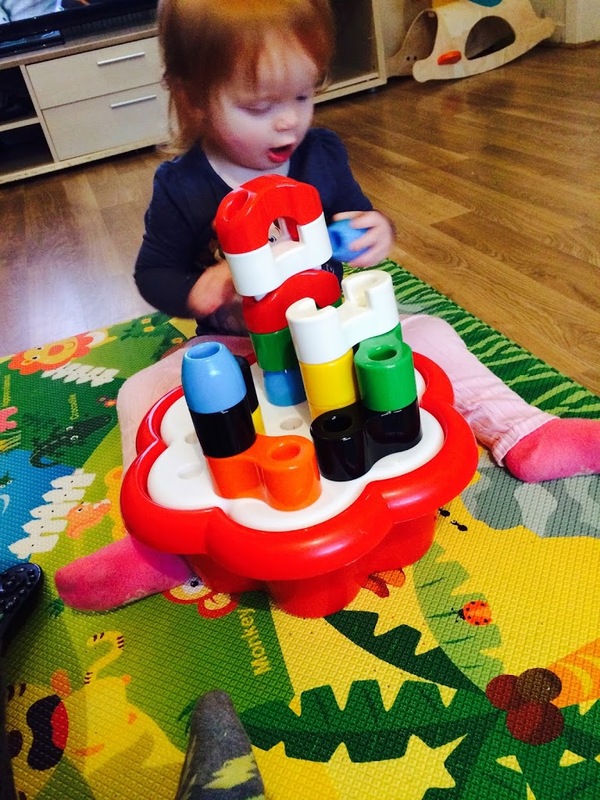 Aria loves it and has lots of fun building and even holding the blocks.They are well shaped, well made and a lot of fun. This would make a perfect first Christmas gift. This is available from Kind Toys. I would highly recommend these.